The combination of dalantercept plus axitinib (Inlyta) failed to significantly improve progression-free survival (PFS) in patients with advanced renal cell carcinoma (RCC) compared with placebo, according to results from the phase II DART trial. The median PFS for dalantercept plus axitinib was 6.8 months versus 5.6 months for placebo plus axitinib, and the experimental combination did not reduce the rate of disease progression or death (HR, 1.11; 95% CI, 0.71-1.73; P = .67). Dalantercept is an ALK1-receptor fusion protein that acts as a ligand trap for bone morphogenetic proteins 9 and 10. Acceleron Pharma announced that it is ending development of the drug. 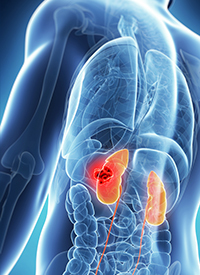 The DART clinical trial was a 2-part study in patients with advanced renal cell carcinoma. Part 1 is a dose-escalation study of dalantercept plus axitinib to evaluate the safety and tolerability of the combination in patients whose disease has progressed following 1 to 3 lines of prior therapy. Part 2 is a randomized, double-blind study of patients with advanced RCC who have progressed following treatment with a VEGF inhibitor. Patients may have also received prior mTOR therapy and/or immunotherapy. Efficacy data are based on 119 patients who received any study drug. Fifty-eight patients were randomly assigned to dalantercept plus axitinib and 61 patients were randomly assigned to placebo plus axitinib. PFS for patients who had received 2 or more prior systemic anticancer therapies was the key secondary endpoint. Again, the experimental combination failed to improve median PFS compared with placebo: 8.1 months versus 7.0 months (HR, 0.78; 95% CI, 0.33-1.87; P = .29). The confirmed objective response rate for the combination was 19% versus 25% for placebo (P = .43). Frequency of grade ≥3 adverse events (AEs), regardless of causality, were similar between the 2 groups: 59% for the experimental combination versus 64% with placebo. Frequency of serious AEs of any grade, regardless of causality, were also similar: 29% in the combination arm versus 26% in the placebo arm. Phase I data were published in December 2016. Fifteen patients were enrolled in the dose-escalation phase; 6 patients were treated at the 0.6 mg/kg dose level, 4 at the 0.9 mg/kg dose level, and 5 at the 1.2 mg/kg dose level. In the dose-expansion phase, 9 patients entered treatment at the 1.2 mg/kg dose. Five patients later joined a second expansion cohort at the 0.9 mg/kg dose level. At the time of the report, the median PFS at the recommended phase II dose level of 0.9 mg/kg was not estimable, but exceeded 9.6 months (n = 9). At 12 months, the PFS rate was 39.7% across all cohorts and 50% for patients treated at the 0.9 mg/kg dose. Overall survival was 75% across all cohorts and 88.9% at the 0.9 mg/kg dose level. Twenty-eight of 29 patients were evaluable for radiographic tumor response assessment. Seven patients (25.0%) had partial response, 17 (60.7%) had stable disease, and 4 (14.3%) had progressive disease as their best response. Fourteen patients achieved disease control (partial response + stable disease) for >6 months, for a disease control rate of 50%. Investigators reported no dose-limiting toxicities, grade 4/5 drug-related AEs, or serious bleeding events in the dose-escalation cohorts (n = 15). The most common (≥20%) drug-related treatment-emergent AEs included fatigue, diarrhea, peripheral edema, nausea, increased creatinine, epistaxis, pericardial effusion, and telangiectasia. The DART Study: Results from the dose-escalation and expansion cohorts evaluating the combination of dalantercept plus axitinib in advanced renal cell carcinoma. Voss MH, Bhatt RS, Plimack ER, et al. Clin Cancer Res. [published online December 28, 2016] doi: 10.1158/1078-0432.CCR-16-2395.